Alter The Press! 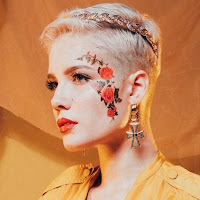 : Halsey Releases New Single "Now Or Never"
Halsey Releases New Single "Now Or Never"
Halsey is back with a brand new single titled "Now Or Never" today. The video, which can be viewed below, was shot in Mexico City and co-directed by Halsey and Sing J Lee [CHVRCHES, Muse, Years & Years]. The track is the first taste of her anxiously awaited second full-length album, hopeless fountain kingdom, which Halsey executive produced alongside Benny Blanco, Greg Kurstin, Lido and Ricky Reed. Set for release on June 2nd, 2017, the album is now available to preorder here.